Bicton Arena in Budleigh Salterton, Devon saw forty-six pony riders gather to compete in The Stable Company HOYS 138cms Qualifier on Sunday and it was Claudia Moore who claimed top spot after delivering three faultless rounds. With each combination hoping to take home one of the three places on offer for The Stable Company HOYS 138cms Championship Final held at the prestigious Horse of the Year Show in October, the first two rounds saw competitor numbers whittled down until just three determined combinations were left to do battle against the clock in the final jump off. 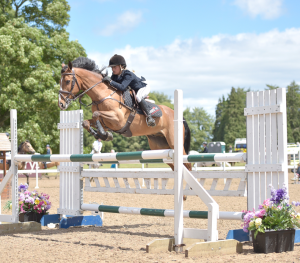 Taking her place at the top of the leader board was Claudia Moore, aged 12, from Brentwood, Essex with Tullineaskey Fear Deas, a 16-year-old bay gelding owned by Katrina Moore. This combination had speed on their side as they stormed to a consistent treble clear in just 36.79 seconds. Scooping second place was Charlie Rea Nelson from Otley, West Yorkshire riding Kiltormer Dan, a 15-year-old black gelding owned by Susan Nelson. This partnership booked their Horse of the Year Show place with a treble clear in 48.13 seconds. As the final combination to make it through to the jump off, Red Morgan, aged 13 from Malpas, Cheshire and Quest Du Buhot, a 13-year-old chestnut gelding owned by Didy Morgan had done enough to secure their place at the final so took the decision to withdraw from the jump off. Liverpool International Horse Show Early Bird Offer 20% Off ENDS 30th June! It’s all systems go with a feast of top class show jumping, family entertainment and new for 2017 – Dressage to Music – planned for this year’s Liverpool International Horse Show – 29th-31st December 2017. And if that’s not all the show is running an Early Bird offer with a great 20% off tickets bought before June 30, 2017. Tickets start from as little as £13 plus booking fees. 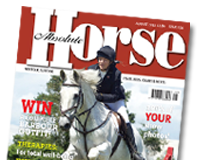 Simply log on to www.liverpoolhorseshow.com and enter the code EARLYBIRD20 at the checkout – book today – don’t miss out and be disappointed! The three days at the Echo Arena on the city’s historic waterfront are set for another equestrian extravaganza building up to a New Year’s Eve celebration like no other. The new Inter 1 Freestyle Dressage to Music will be the feature of the Friday evening performance. The ‘edge of the seat’ Puissance takes centre stage on the Saturday night while the Sunday evening includes the Grand Prix and a family friendly spectacular way to see in the New Year with fireworks and celebrations in the arena until 12.15am. All tickets give access to the show’s shopping village from 9am each day, with the shopping experience featuring a fantastic range of products from high-end equestrian outlets, exclusive fashion retailers, unusual giftware and beautiful things for the home. There will be improved food and drink outlets on-site, including an upstairs family restaurant, food outlets and champagne bar next to the warm-up arena, and opportunities to meet and greet top riders throughout the show. If you’re a horse fan excited to see some exhilarating 4* level competition, or simply wanting a great family trip to celebrate this New Year the Liverpool International Horse Show is the place to be. Thieves sadly recently broke into a Kent-based yard belonging to Team Tutsham, a registered charity that works with children from a variety of backgrounds to teach them riding and life skills, and stole almost all of the charity’s tack. Dressage rider Dan Watson, who with his ride Amadeus is on the British Nations Cup team, is appalled by the theft, and says Team Tutsham works tirelessly to give under-privileged children a leg up in life. “The charity gives the children it works with stability and support to grow and gain confidence through equine-related activities. Some of these kids have already flourished to pastures new. If anyone has any spare tack or equipment that would help them to get back to normality, please donate, as it would give the charity and the kids a huge boost. Please call Maxine Buckby on 07971 298337 if you can donate any tack, especially saddles,” advises Daniel, an ambassador for the charity. 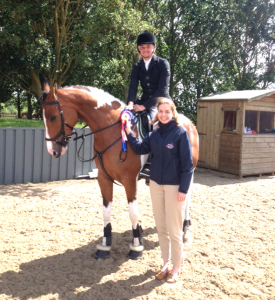 The KBIS Insurance Senior British Novice Second Round at Houghton Hall Equestrian Centre in Huntingdon, Cambridgeshire was won in fine style by Ronnie Jones who secured victory with three confident clear rounds. With a keen starting line-up of fifty-seven combinations, the contest for a place in the KBIS Insurance Senior British Novice Championship Final which is to be held at the British Showjumping National Championships in August was a fierce one. With the hope of achieving a sought after treble clear over David Ackland’s course, each competitor set about the class with determination. Ronnie Jones from Dunmow, Essex claimed his place in the twenty-six horse jump off after producing two clears. Riding Ruth Dowie’s 7-year-old skewbald mare, Derawley Lady, Ronnie picked up speed to cross the finish line on a treble clear in an unbeatable time of 41.06 seconds. Seventeen-year-old Adele Rand from Haverhill, Suffolk was delighted to jump into second place on board her own Calypso Blue. This 6-year-old grey gelding has been produced slowly by Adele and they took the challenge of their first Senior British Novice Second Round in their stride. This young partnership finished with a treble clear in a 42.94 seconds. Third place went to Benjamin Cornwall from Clifton, Nottinghamshire riding Andrea Cox’s 7-year-old grey mare Minim E. This pair stopped the clock on a treble clear in 44.37 seconds. With a further eight riders also achieving a treble clear, eleven combinations will now go forward to the KBIS Insurance Senior British Novice Championship Final. 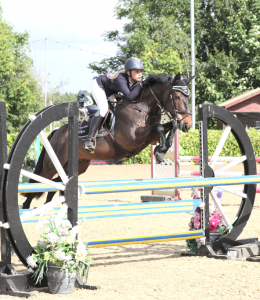 The Stable Company HOYS 138cms Qualifier took place at The College Equestrian Centre in Keysoe, Bedford recently and it was Rosie Collins who topped the leader board. Forty young riders came forward to contest for one of the three places on offer for The Stable Company HOYS 138cms Championship Final held at the prestigious Horse of the Year Show in October. The first two rounds whittled competitor numbers down until just five keen combinations were left to do battle against the clock in the final jump off. Over the jump off course, Rosie Collins from Rayleigh, Essex delivered a lightning fast round on board Thyme Flies, a 15-year-old bay gelding owned by Anastasia Snook. This pair picked up the pace by taking a fast line in 44.73 seconds and were unfortunate to have pole midway through the course for 4 faults. Claudia Moore, aged 12, travelled from Brentwood, Essex with My Bugsy Malone, a 25-year-old black gelding owned by Katrina Moore. This pair had two fences down towards the start of the course and went on to cross the finish line in 58.72 seconds with 8 faults and a single time penalty. Taking third place was 12-year-old Jake Myers riding Joanna Myers’ 24-year-old grey gelding, The Agent. This combination stopped the clock in 61.19 seconds with 8 faults and 4 time penalties. Under rain clouds at The College Equestrian Centre in Keysoe, Bedford, seventy-one hardy combinations came forward recently to jump in the Connolly’s RED MILLS Senior Newcomers Second Round and it was 15 year-old Anja Moret who topped the table. Each rider began the class with high hopes of claiming one of the two qualification spots on offer for the Connolly’s RED MILLS Senior Newcomers Championship Final, which will be held during this October’s Horse of the Year Show. Following two challenging rounds of showjumping, just seven horses and riders were taken forward to the final jump off and only one combination went on to secure a treble clear. Anja made the journey from Chelmsford, Essex worthwhile as she rode Spencer Moret’s 7-year-old grey gelding, Fell Capone, to the win. This combination proved their talent for accuracy as they jumped two confident clear rounds to book a place in the jump-off before going on to be the only combination to deliver a treble clear. They stopped the clock in 50.67 seconds. Scooping up second place was Adam Botham from Radway, Warwickshire riding Jerome Du Luot, an 8 year-old chestnut gelding owned by Michael Lyons. This pair had speed on their side as they crossed the finish line in 49.17 seconds but unfortunately had a pole down early on the course leaving them with four faults. 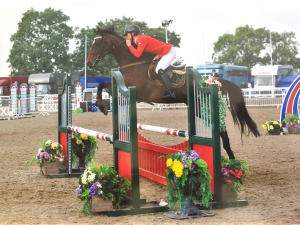 The riders and horses that finished in third to fifth took home the chance to compete in the Connolly’s RED MILLS Senior Newcomers Masters at the British Showjumping National Championships. Scarlett Baker and her Ex Racehorse ‘Blowing A Hoolie’ from Chelmsford, Essex are holding onto a 12 point lead in the Retraining of Racehorses (ROR) Bronze League running up to the Championship which will take place at the British Showjumping National Championships at the National Agricultural and Exhibition Centre (NAEC), Stoneleigh Park, Warwickshire (8th – 13th August 2017). Blowing A Hoolie, known as Fidget at home, a 9 year-old bay mare by Val Royal (FR) out of Moly (GB) is showing her natural talent in the showjumping ring after a racing career over hurdles and on the flat. Scarlett brought Fidget straight from the field, having found her by accident. After initially looking for her to be a fun riding horse, they are thrilled with her new found success. Scarlett who works at Chelmsford City Racecourse is overjoyed to see ex racehorses successfully competing in new disciplines after their racing careers. ARE YOU PASSIONATE ABOUT HORSES? DO YOU LOVE THE TOGGI STYLE? Have you got a taste for blogging and love to share your equestrian life with the world? If so, Toggi needs you! Toggi are looking for an enthusiastic Real Rider to blog on all things related to #LifeintheSaddle. The chosen rider will join their existing team of bloggers who provide them with regular website blogs, images, social media posts and reviews on the Toggi range. In return the real rider blogger with receive the latest products from the Toggi Equestrian clothing range to wear whilst enjoying #LifeintheSaddle and will also get to have sneak peaks at the next season collection! If you think you have what they are looking for head over to their website and complete the entry form. Closing date for receipt of entry is Friday 16th June 2017 at 11:59pm GMT. 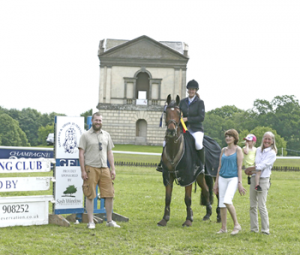 Watched by an eager crowd at Houghton International Horse Trials in Kings Lynn, Norfolk, Laura Newson jumped in to first place in the Nupafeed Supplements Senior Discovery Second Round hosted by the Norfolk Showjumping Club on Saturday. 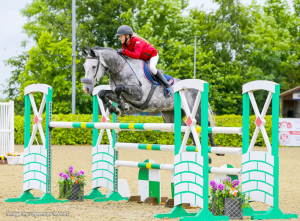 With a treble clear the goal of each and every rider as this would book a place in the Nupafeed Supplements Senior Discovery Championship Final, which will be held during the British Showjumping National Championships in August, a competitive class unfolded. Just five competitors took their place in the jump off after producing a double clear across the first two rounds, leading to a nail biting final round where all eyes fell on the all-important clock to decide the winner. Local rider Laura Newson from Norwich, Norfolk gave the winning performance on board Gemma Wiffen’s 8 year-old bay gelding, E Brightwood Dorado. This pair really put their foot down to produce their treble clear a whopping 11.21 seconds ahead of the competition, crossing the finish line in 41.23 seconds. Scooping second place was Chloe Coward from Peterborough, Cambridgeshire riding her own 5 year-old grey gelding, H Blokx. This combination took a slower line to ensure they finished with a treble clear in 52.44 seconds. Taking home third place was Abigail Richards from Attleborough, Norfolk with her 11 year-old dark bay gelding Mulvin on the Ball. This partnership jumped the final treble clear of the class in a time of 58.54 seconds. These three combinations will now go forward to the Nupafeed Supplements Senior Discovery Championship Final. NB: Qualifications will be updated pending official grading of results. The British Showjumping National Championships 2017 will take place during the 8th – 13th August at the National Agricultural and Exhibition Centre (NAEC), Stoneleigh Park, Warwickshire.